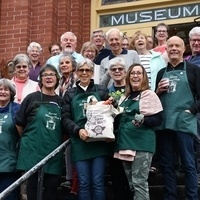 To spotlight National Volunteer Week, the Edmonds Historical Museum is sponsoring a community Volunteer Open House on Saturday, April 6, 2019. Representatives from cause driven organizations will be available at the museum from 12:00 to 3:00 pm. This is a unique opportunity for YOU to find imaginative ways to engage in our Edmonds community and is good for students looking to fulfill credit hours. This event is free of charge and open to volunteers of all ages. The organizations are Art Walk Edmonds; Cascadia Art Museum; Clothes for Kids; City of Edmonds Beach Docent; Edmonds Arts Festival; Edmonds in Bloom; Edmonds Center for the Arts; Edmonds Wildlife Habitat and Garden; Friends of the Edmonds Library; Save Our Marsh; Events managed by the Edmonds Chamber of Commerce; A Taste of Edmonds; An Edmonds Kind of 4th; Edmonds Classic Car Show; Edmonds Trick-or-Treat; Edmonds Tree Lighting Ceremony and Clam Chowder Cook-Off, will also be represented. Edmonds Historical Museum will feature: Museum Ambassador, Garden and Summer Farmers' Markets; 4th of July Carnegie Float; Heritage Days; Halloween Haunted Museum; Scarecrow Festival and Museum plaza improvements.